Ford wants Indiana Jones to die, George Lucas wants him to live, and Steven Spielberg hasn't made up his mind yet. 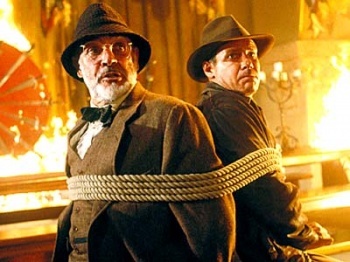 Insider sources are suggesting that Harrison Ford thinks that his second most iconic character, archaeologist/adventurer Indiana Jones, should not survive a fifth Indy movie. Supposedly, Ford is keen that his character should pass his hat and whip on to a successor - likely to be the character of Mutt, portrayed by Shia LaBeouf - and then shuffle off his mortal coil. Lucas apparently hates the idea, and Spielberg is said to be considering it. Obviously this is just rumor, but Ford has said in the past that he wished Han Solo had died in Return of the Jedi, so there's no reason he couldn't say the same thing about Indiana Jones. It won't be the first time Lucas has been reluctant to kill off one of Ford's characters either. Han was originally supposed to die in the middle of the movie, but Lucas wanted to preserve merchandising revenues, and so had the script rewritten to keep all the principle characters alive. It's not much of a stretch to imagine that his "Harrison-Ford-must-survive" policy extends to the Indiana Jones movies too. The next Indiana Jones movie is supposedly set in the Bermuda Triangle, with LeBeouf as the movie's star. These are just more rumors though, so make as much or as little of them as you will.